The bus has left Belgaum on time and is slowly warming up to the overnight journey to Hyderabad. As it motors away into the distant sunset, it picks up good rhythmic speed, lulling me into a slumber. When I wake up, we are at a tea-stop and my new husband (don’t worry, this is a story from 29 years ago) has stepped out of the bus, surely in search of something to eat, I jump to a backed-by-experience-conclusion, a tad impatiently. He grins at me charmingly, cutting my lambast mid-sentence and proffers a newspaper cone containing some steaming kanda pohe. No way! I turn up my nose. But the nose has a will of its own and won’t get turned up. Instead, it seeks that most delicious aroma wafting from the newspaper cone. The eyes follow suit, taking in the perfect bright yellow phodnichey pohe or beaten rice,each moist but firm grain separate, beautifully garnished with fresh chopped onion, sev and coriander, a little wedge of lemon pertly perched on the side. The mouth waters in mutiny, the stomach growls seditiously, reminding me that the hurried lunch I had had was long gusted from the gut. Shall I get some more, the husband asks and I nod enthusiastically – inadvertently ...conveniently ignoring the hint of teasing in his voice. These pohe are undoubtedly the most delicious ones I have ever eaten. I am lurched out of my reverie as the bus starts. The husband’s not back yet. I look around me and am suddenly worried, where could he be! The conductor should have at least given a warning. But he was just around the corner – hey wait! Worry turns into panic, but only momentarily so – I spot him making his way to his seat beside me, balancing his way forward while holding on to the newspaper cones. 29 years later, I still get teased, baited, tempted, coaxed out of dogmatic or pragmatic resistance to any new idea – with a gentle reminder of the pohe of Yergatti. Sieve the pohe in a colander to get rid of pohe dust and chaff and pick the paddy bits, if any. Wash the pohe in cold water and drain in the same colander and keep aside for about 8-10 minutes. Fluff the soaked pohe a little. Heat the oil in heavy bottomed kadhai. Add mustard seeds and let them crackle. Add the peanuts and fry for a minute or two, then add the hing, chillies, curry leaves and sauté for few seconds. Add the chopped onions and sauté till translucent and then add the cubed boiled potatoes cook for a few minutes. At this stage add the turmeric – if you don’t cook the turmeric too much, it will give a nice light yellow tinge to the pohe. Now quickly add the soaked pohe, salt and sugar to taste and mix well. Cover with a lid and cook for a further 5 minutes till you see white steam escaping from the lid. 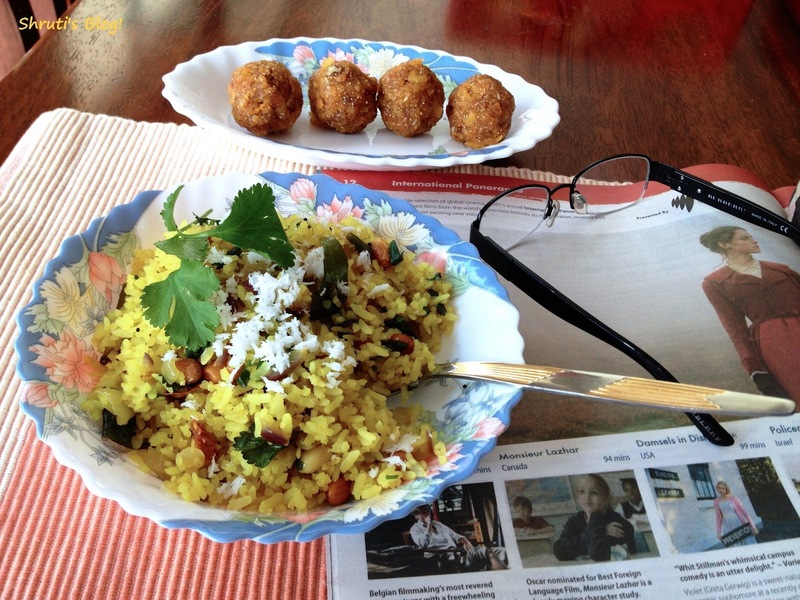 You will have to test the grain of poha to see if it is cooked. If the pohe are dry, sprinkle some water or milk and cover and cook further for a few minutes. Remove from heat. Add the lemon juice and mix. Beautiful write up, as always :-)!! :) relish - enjoy what ever you like the best!